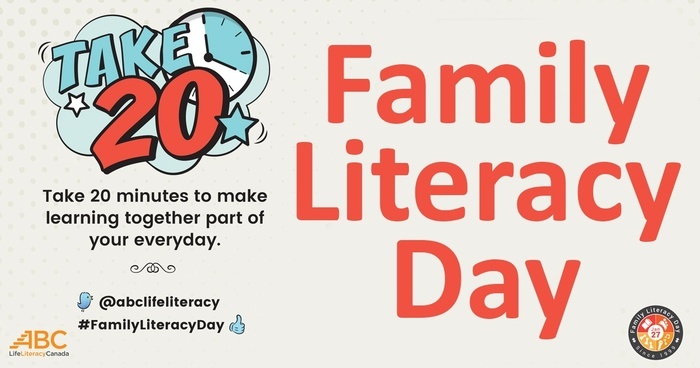 January 27, 2019, is the 20th Anniversary of Family Literacy Day! In honour of the twentieth anniversary of Family Literacy Day, we're encouraging families to Take 20! Every day, take 20 minutes (or more!) to read, write, talk, sing and play with your child(ren). To encourage local children to learn language and literacy skills through play, we will be refreshing our learning toys available in the children's sections of Calvin Park and Isabel Turner branches. Come play!